Today’s Abiding Together Podcast is part 4 of our series on the women doctors of the Church. 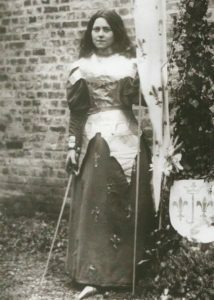 This episode is on St. Thérèse of Lisieux. 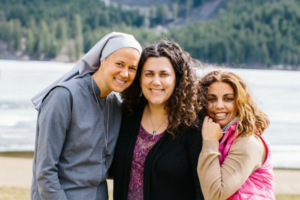 We talk in depth about her “little way”, a path of deep trust in God that allowed her to love in small and courageous ways and led to her sainthood. We chat about the universal call to holiness, the acceptance of our weaknesses, and how to grow in deeper trust. St. Thérèse surrendered in trust to God, in what ways do you need to grow in trust? 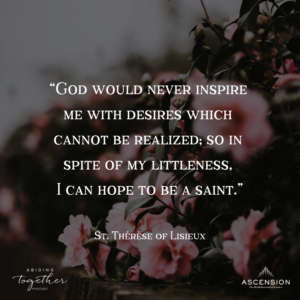 St. Thérèse embraced small sacrifices to love God and her neighbor, how can you make small sacrifices this week for love? God is drawn to our weakness. Have you or how have you allowed yourself to experience God’s deep love in your areas of weakness? God works miracles in the mundane moments of life, if we open our hearts to grace. How can you become more aware of God’s presence in the simple places of normal life? How is God calling you to become “little” and more dependent on God in your life? What areas of brokenness do you need to invite the Savior to come in to today? St. Thérèse talked about the importance of all the flowers being different. How is God calling you to let go of jealousy and comparison and embrace your gifts? The Lord is my shepherd, I shall not want. He makes me lie down in green pastures; He leads me beside quiet waters. He restores my soul; He guides me in the paths of righteousness for His name’s sake. Even though I walk through the valley of the shadow of death, I fear no evil, for You are with me; Your rod and Your staff, they comfort me. You prepare a table before me in the presence of my enemies; You have anointed my head with oil; My cup overflows. Surely goodness and loving kindness will follow me all the days of my life, and I will dwell in the house of the Lord forever. We did a little spontaneous video podcast a couple of weeks ago, which we posted on our Facebook Abiding Together Podcast page.